It’s scape season and scapes are on the menu at our house! We’re picking scapes like mad and eating them every chance we get. 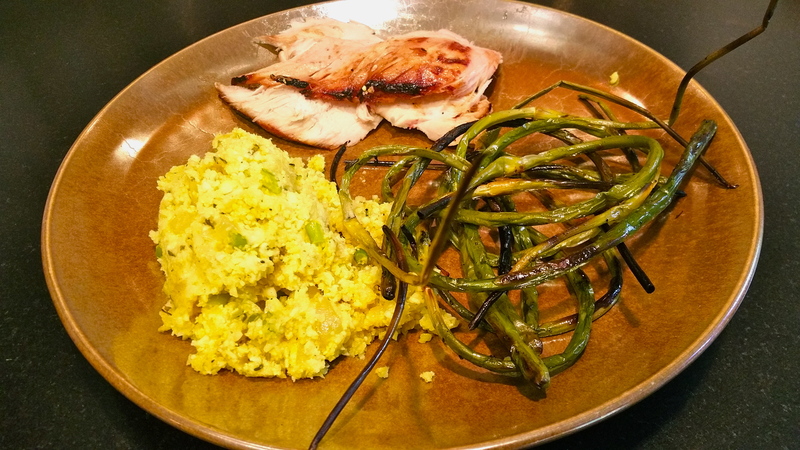 Last night we enjoyed chicken BBQ with cauliflower “rice” made with sweet onions and garlic scapes and it wouldn’t be a BBQ without grilled garlic scapes. This entry was posted in garlic scapes, Gourmet Food with Garlic, In the Garlic, Local Food, Vermont. Bookmark the permalink. Thank you so very much!! The garlic scapes are everything I dreamed of- your shipping was perfect and so generous with the scapes. Many thanks I will highly recommend every chance I get and will be back to order more next year. Unable to find you on yelp wanted to leave a most deserving positive review. Thank you for growing such an amazing tasting scape, and for your customer service!